Almost everyone I know has had a cold, cough, virus, sore throat or something similar over the last few months and, with Christmas festivities ending and a New Year just beginning, our bodies will be under a lot of pressure fending off all sorts of bugs from…well all sorts of people and places given the last few weeks likely exploits! No one wants their their New Year's resolutions to never get off the ground! So here are a few ideas to help you stop getting ill over the coming months. Some are well known and some perhaps less well known. I’ve even roped in our team physio, Lily, and Head of Sports Science, Paul, to share their words of wisdom! 2) Prevent contact: Wash and sanitise your hands often. Touching your eyes, nose and mouth with your hands is the most common way of bacteria getting in your body. Research shows that the average person touches their face with their hands 16 times an hour. That’s 192 contact points for a 12 hour day. Limit the chances of bacteria getting a free ride into your body by regularly washing hands thoroughly and using a sanitising hand foam that contains Byotrol. Things I always travel with! Listen to your body, if you are starting to feel a bit tired or you know you have a busy week coming up, then ensure you get some down time where you can relax or get some extra sleep. 2) Get the flu jab - either from your GP if you are eligible, or from Boots or other pharmacies that do them privately. 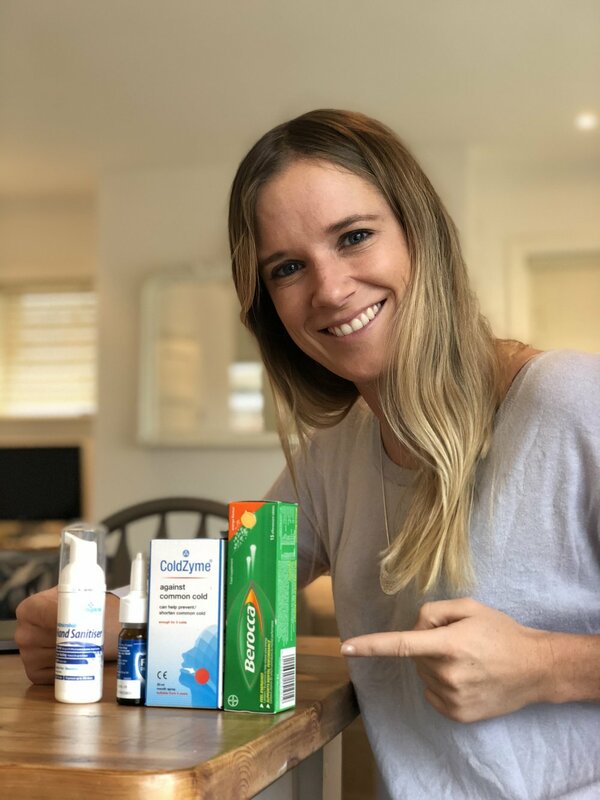 3) First Defence nasal spray and or a Coldzyme throat spray can be good barriers to help minimise virus getting into your system. 4) Try where possible to avoid people that are ill - and if you are in contact with people that are ill be extra diligent with your hand hygiene (washing and antibacterial gel or foam). 1) Cram a Nutri-bullet or similar into your daily routine to get in some good vitamins. It’s super hard especially over the festive period to stick to this habit and this is an easy way of getting loads of goodness in to your body! 2) First Defense! I think this is amazing if you are feeling on the edge. Make sure you use it as soon as you start to feel funny, or use as precaution if you know you are at risk. Cold Zyme is also great, especially if you are prone to getting sore throats. 3) Carry a hand foam or gel – a little strange perhaps but honestly we did this incessantly at the Olympics and it does make a massive difference. Especially if you are in larger groups or surrounded by snotty children! Not staged at all...!! I am not personally sponsored by HydrateM8, but I do love their water bottles! I hope some of these can help everyone stay happy and healthy and feel free to comment with any other tips or questions you might have. Have a great 2018 - I can’t wait to hear people’s resolutions, goals and dreams. Let’s give it everything!